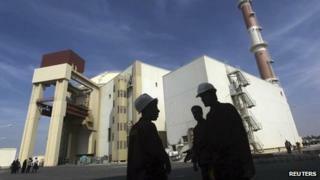 Iran says it has found major new uranium deposits and is planning to expand its nuclear power programme. It said 16 sites had been identified as suitable for the construction of new power plants over the next 15 years. Iran said the find - which has not been independently confirmed - would treble the size of known uranium deposits. Under UN sanctions, Iran is banned from importing nuclear material. It is due to hold talks with Western powers on Tuesday about its nuclear programme. The US and its allies are widely believed to be planning to offer Iran some relief from sanctions at the talks in Almaty, Kazakhstan. France confirmed a "substantial" new offer would be made, French news agency AFP quoted the foreign ministry as saying. Three rounds of meetings in Moscow ended last June in stalemate. Iran denies charges that it is secretly developing atomic weapons and insists that as a signatory of the Nuclear Non-Proliferation Treaty (NPT) it is entitled to develop a nuclear power programme. But tightening sanctions have squeezed Iran's economy, with oil revenue slashed, a currency that has nosedived in value, and growing unemployment. As a result of years of study, 16 new sites had been identified as suitable for the construction of nuclear power plants, said the Atomic Energy Organisation of Iran (AEOI) in reports carried by Iranian news agencies. The sites - on Iran's north and south coasts, Khuzestan province and north-western Iran - were chosen in part for their resistance to earthquakes and military strikes, it said. In separate reports, the AEOI praised experts' "round-the-clock efforts" for having resulted in the discovery of uranium deposits, "multiplying the current amount of its resources". According to media reports, discoveries over the past 18 months have trebled Iran's reserves of raw uranium, which now stand at 4,400 tonnes. "This made it possible for the Islamic Republic of Iran to move to a more advanced level in the field of nuclear industry among those countries that possess nuclear technology," Iranian news agency Irna quoted the AEOI as saying. There is no independent verification of the find but Western experts had reportedly previously estimated that Iran might be coming close to using up its supplies of raw uranium. The developments come as Iran gears up for another round of talks with the so-called P5+1 grouping of nations. These comprise the five permanent members of the UN Security Council - the US, UK, France, China, and Russia - plus Germany. The group has called on Iran to scale back its uranium enrichment - needed both for power plant fuel and, in higher purities, for the creation of a nuclear weapon. But Iran had "fulfilled its NPT obligations" and would "defend its rights including its nuclear rights", said its top nuclear negotiator Saeed Jalili, in remarks quoted by semi-official Iranian news agency Isna. "If the 5+1 want to enter constructive talks, then they should enter with a new strategy and proposals. We hope the 5+1... enter on a path that can win the Iranian people's trust," he said. Only 10 days ago, Iran announced an upgrade to Iranian enrichment machines or centrifuges - believed to be able to enrich two or three times faster than the old equipment. Western powers have hinted that they will make Iran an offer that includes significant new elements which media reports have speculated could include an easing of sanctions on Iranian trade in precious metals. According to the International Atomic Energy Agency (IAEA), "overall, credible" evidence exists that until 2003, and possibly since then, Iran conducted nuclear weapons research. The IAEA has also expressed concern about extensive changes at Iran's Parchin military base, where the agency suspects that explosives tests relevant to nuclear weapons have taken place in the past - a charge Iran denies. Iran has so far resisted pressure to allow the IAEA access to Parchin.